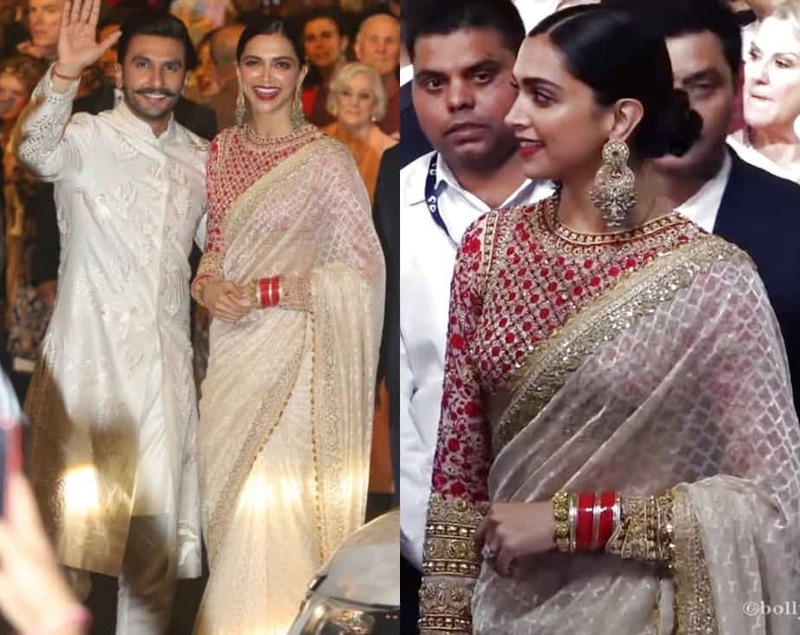 Celebrity Sarees Deepika Padukone’s Post-Wedding Strong Saree-Game We Can Never Recover From! 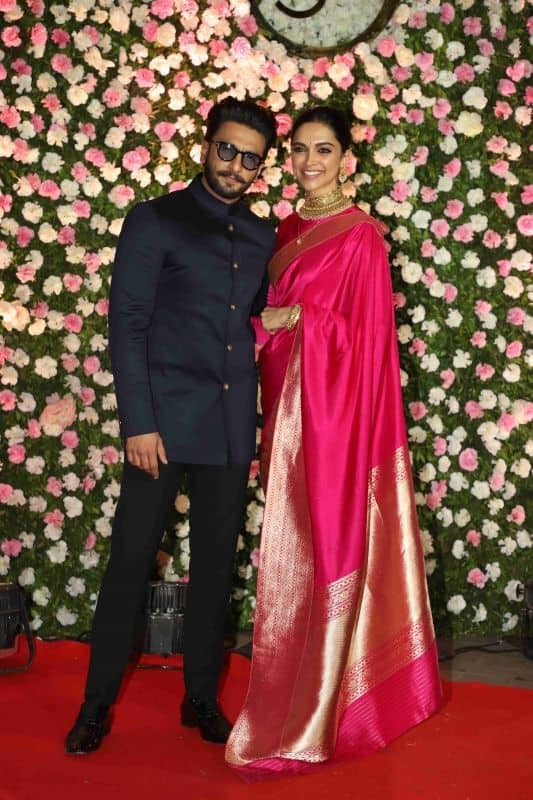 Deepika Padukone’s Post-Wedding Strong Saree-Game We Can Never Recover From! The Queen of hearts – Deepika Padukone is surreal in every true sense and we are sure you would agree too! She rules the fashion world just like she rules the acting world! She can pull off simple jeans with a top look and a graceful saree in the most beautiful way possible! Be it her Sabyasachi saree look or her Manish Malhotra stylish saree; this South Indian beauty charms us all over again. So, here are some best Deepika Padukone saree looks at we loved in the recent times..
After her wedding, Deepika Padukone has been raging in Saree game like a pro. We haven’t even recovered from her drool-worthy wedding pictures yet and she decides to up her saree game. The newlywed Deepika Padukone looked resplendent as she donned this gorgeous saree by Faabiiana for Isha Ambani’s pre-wedding bash. Keeping her look simple, she picked a multi-layered statement necklace and simple danglers to compliment her beautiful Chooda. Deepika definitely exuded beauty, grace, and sensuality. A regal look for Isha Ambani’s wedding, Deepika Padukone is a vision in a jamdani saree bordered with golden zardozi by Abu Jani Sandeep Khosla. With a full-sleeved zardozi and vasli embroidered blouse and her hair in a neat bun, the actress accessorized her look with heavy jewelry. Deepika Padukone looks jaw dropping-ly mesmerizing in a rani pink saree by Raw Mango that she donned for Kapil Sharma’s wedding reception. With hair pulled back in a knot with gajras and a marvelous golden choker, she looked every bit of a South Indian beauty. 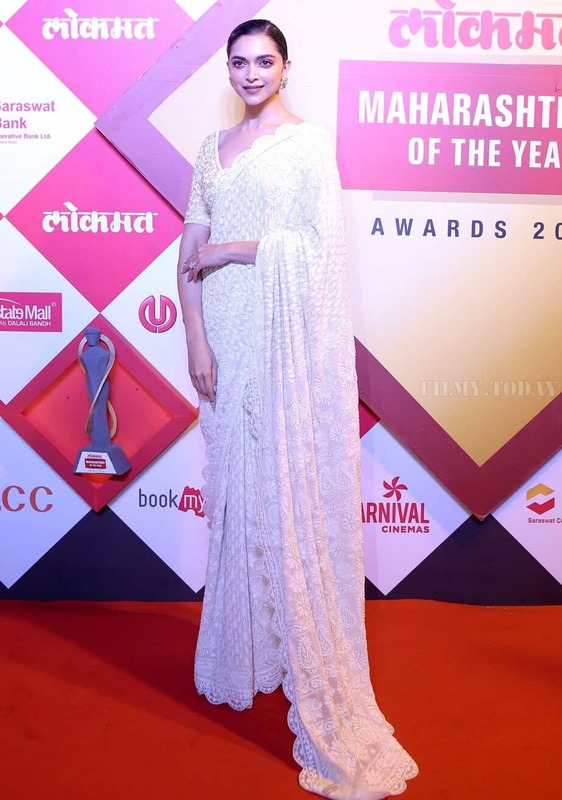 Deepika Padukone yet again left everyone stunned at the red carpet of the annual Lokmat Maharashtrian of the Year awards donning a beautiful white chikankari saree. Paired up with a hand-embroidered ivory blouse, the elegant white saree with the scalloped border was from Rahul Mishra’s ‘Charbagh’ collection. Tying her hair in a glossy bun, she completed her look with large golden earrings. And the very recent, for Akash Ambani and Shloka Mehta’s wedding, Deepika looked dipped in sheer elegance! A melon red saree by Sabyasachi from his recent collection with an elegant pearl choker and necklace set. This dazzling lady remains a fashion inspiration in Indian and Western apparel. She seems to have mastered every little secret of rocking sarees in a traditional way or with a modern twist. 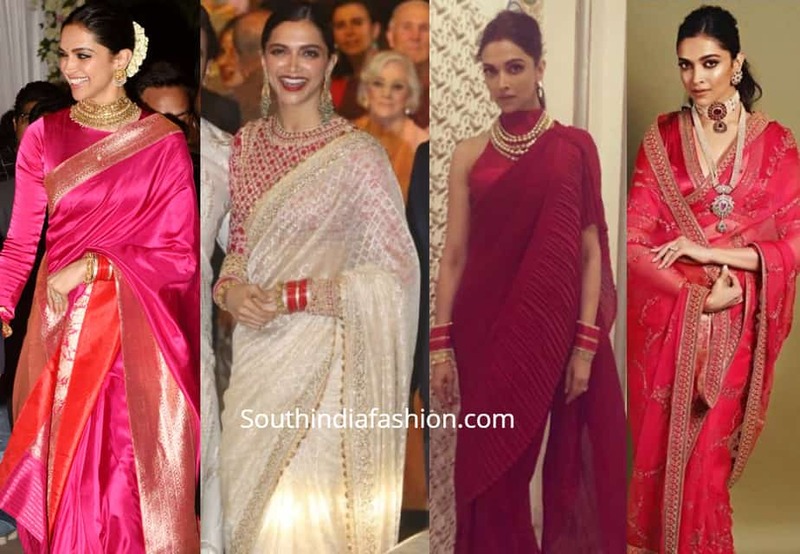 14 Latest Deepika Padukone Saree Looks! 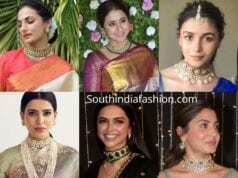 How To Wear The Trending Choker Necklace With Indian Outfits!